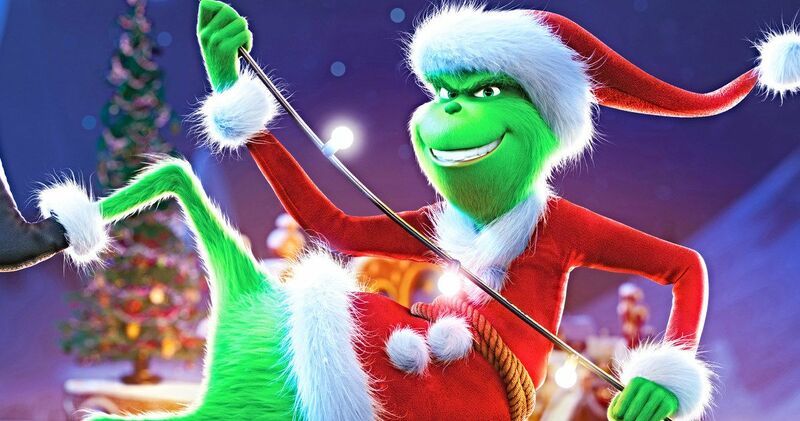 Dr. Suess’ beloved Christmas grouch is adapted once again for the big screen. The Grinch is a syrupy sweet, CGI animated adventure that will surely enchant children. The grumpy goofball suffers through a series of hilarious missteps on his larcenous quest. The cleverly sprinkled, well-timed humor, facilitates the drawn out runtime. The Grinch is short at eighty-six minutes, but the actual plot could easily have been resolved in thirty. New characters add charm to the filler. A screeching goat and pudgy reindeer are heartwarming scene stealers. The cheerful citizens of Whoville prepare for Christmas with extra fervor. The Mayor (Angela Lansbury) has decreed that this year’s celebration will be three times bigger. Donna Lou Who (Rashida Jones) is excited like everyone else, but as a single mom of three; struggles to get everything done. Her precocious daughter, Cindy Lou Who (Cameron Seely), wants her mother to be happy. Santa Claus is just the right man for the job. Meanwhile in his cave high above Whoville, the Grinch (Benedict Cumberbatch) has run out of food after a marathon of stress eating. He and his only companion, the faithful pooch Max, trek into town for groceries. The miserable green Grinch is accosted by disgusting Christmas cheer. Singing, laughter, joyfulness, he’s reminded how much he truly despises the holiday. The curmudgeon has finally had enough of the awful goodwill. He devises a wicked plan to steal every gift, decoration, and Christmas tree. The Grinch is given a twenty-first century update. The grandfatherly Burl Ives has been replaced as narrator by the smooth-crooning Grammy winner, Pharrell Williams. The dialogue is still largely executed in rhyme, but now with a hip-hop flavor; the same goes for the classic song, “You’re a mean one Mr. Grinch”. The Whos are also noticeably racially diverse, with different types of skin tones and hair. Christian elements and themes remain predominant. Jesus is continually referenced in the abundant Christmas carols. The Grinch has his meanness dialed back. He’s portrayed as lonely and misunderstood. Gone are the devilish grins and sly smiles of the classic cartoon. His anger and contempt is borne from a lost childhood. The film flashbacks to his years in an orphanage. There’s a lot of heart to this story. The Grinch makes an effort to show the value of simple kindness. I admit there are a few scenes that come off as saccharine. But a heaping spoonful of Christmas spirit and love is easily digested. In a world fraught with negativity, children and adults alike will appreciate The Grinch for its positive message. The Grinch is produced by Illumination and distributed by Universal Pictures. Illumination has had incredible success with the Despicable Me series, Minions, and The Secret Life of Pets. I have no doubt that The Grinch will be another huge box office hit. The studio needs to raise their animation standards. I haven’t seen any stylistic growth in their films. Pixar, Disney Animation, and Laika continually release better looking products. Illumination has become visually stagnant. I sincerely hope that Illumination takes a cue from the competition and delivers an eye-popping next film.